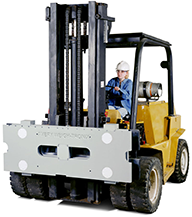 This non legal for trade QuickTach forklift scale system attaches to an ITA Class II (16″ high) or ITA Class III (20″ high) cleat type carriage. Each electronic scale has four application designed Avery Weigh-Tronix Weigh Bars *, a weight summing assembly, coiled interface cable (stretches 20′), choice of instruments (FLI 225 or FLI 425) includes instrument overhead tilt and swtwe! brackets, power cable, miscellaneous installation hardware and manuals.